This week was a little better although I still am tweaking my schedule. Trying to find time to juggle, balance, and maintaining sanity is simply where I am at right now. Each day is a new day. Each day I must take as it is and not try to get too far ahead of myself. For those of you who don’t know, my coffee love runs incredibly deep. I have chosen to give up Starbucks for morals and health purposes. Not that I don’t love their mugs, coffee flavors, or the perks of being a Gold Card Member since 2011, I just know it would be best if I didn’t have a reason to over indulge. In addition to my break-up with Starbucks, I have tried to cut down on my caffeine in-take as a whole. I am choosing healthier options like water infused with lemon or lime, hot tea, or every once in a while an iced black coffee. Due to this change, however I have sorely crashed. I get home and sit….and then I am just done. DONE! Is this a sign of getting old? I have been doing more research on healthy food items that I can pack for lunch. I am looking for better ingredients and over all better food for my body to process. I found a new soup that I like by the brand Pacific Organic Rosemary Potato Chowder. It was a really nice little lunch. I poured half of the container and saved half for later. I also found these chips that were really good too. A new find, Lundberg Redwood Smoky BBQ Multigrain chips, were a tasty inclusion to my lunch. Even though this still isn’t the best for my body to process, it was still better than other choices. They had a different taste to them, but over all they left me satisfied. Motivation at this point in time is just simply staggering. My girl Rachel and I walked two different paths to which we did really well. In just over an hour walked close to 4 miles. We pushed ourselves and that part made me feel really good. Personally, I did continue to meet two goals this week. One goal was to run over a mile consecutively. I ran for a total of 1.21miles. I also wanted to have another day of over 10,000 steps on my pedometer. I was over 13,000 steps! I was really happy about that. Last night, of all nights, I came home with the intention of running. I came home with the intention of taking a brief nap and then getting my bum up to go workout. Well that brief nap was 2-1/2 hours long. Needless to say, I needed to nourish myself with dinner and finish a few projects at the house. I did go with my mom to the grocery store to get some exercise. It was more than I would have gotten sitting at home! I still slept like a rock and went to bed before my usual time. I am emotionally exhausted, physically exhausted, and really trying. This effort was not wasted, I assure you. 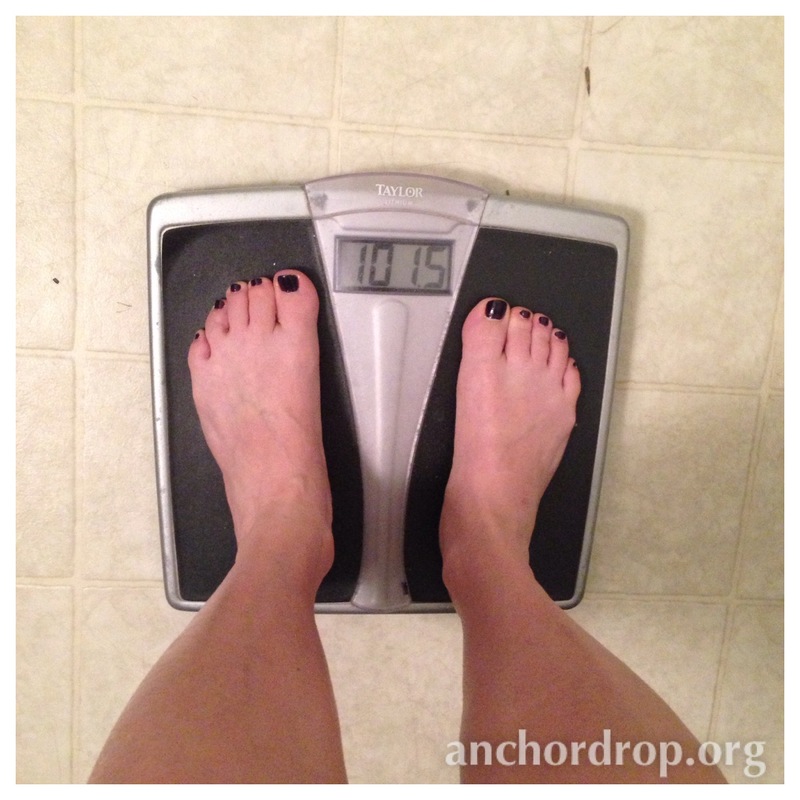 Check out my weigh-in! This has been a really hard 2 week stint for me. Emotionally I am a wreck and I am trying to keep my head up. Physically, I feel like I am bloated. I feel like no matter how hard I work it just isn’t enough. I am so tired by the end of the night that workouts are becoming daunting. I am still in the game though….I promise!